In the last 18 months, I have noticed a concerning shift in the sentiment of learning professionals about ramping up the quality of their measurement and in particular their reporting. This sentiment had been quite prevalent 10-12 years ago, but abated for a while. Now it’s back with a vengeance. I’m not imaging this shift. Brandon Hall Group recently published a study entitled, “Learning Measurement 2016: Little Linkage to Performance.” In their study, they found that the pressure to measure learning is coming mostly from within the learning function itself. In addition, of the 367 companies studied, 13% said there was no pressure at all to measure learning. What’s concerning about this situation? L&D has been saying for years that it wants to be a viewed as a strategic partner and get a seat at the proverbial table. Yet, the sentiment that “no one is asking for measurement data” is equivalent to saying, “Hey, I’m just an order taker. No orders, no product or service.” If we are going to break free of an order-taking mentality, then we need to think strategically about measurement and reporting, not just the solutions L&D creates. The sad reality is that often business leaders do not ask for L&D data because they don’t know what data is available or they don’t understand its value. Many business leaders assume L&D is only capable of reporting activity or reaction (L1) data. Many still pejoratively refer to L&D evaluations as Happy Sheets or Smile Sheets. If they believe that’s all L&D can do, then of course they won’t ask or exert any pressure to do more. Equally importantly, innovation would come to a standstill if organizations only produced products and services that resulted from a client request. Henry Ford famously said, “If I had asked people what they wanted, they would have said faster horses.” Steve Jobs talked about the dangers of group-think as a product development strategy when he said, “It’s really hard to design products by focus groups. A lot of times, people don’t know what they want until you show it to them.” Simply because your internal client cannot envision what you can provide does not mean you shouldn’t provide it and then iterate to get it right. What can you do differently right now? Reframe the problem: If truly ‘no one is asking”, stop and ask yourself, “Why aren’t leaders asking?” Is it because this information has no value or because they don’t understand the value? Is it because they don’t know what L&D can provide?” Based on your answers to these questions, develop a game plan to demonstrate the value of the data you can provide (and then provide it to them). Find a friendly: If you want to break the ‘negative reinforcing loop’, find a business leader who is willing to work with you, a ‘friendly.’ You can spot a friendly fairly easily. She is interested in how L&D can add value to her business. He views you as a trusted advisor, brainstorming how to build new skills and capabilities within his team. She is innovative and willing to try new approaches even if they might not succeed the first time out. If you have one or two such business leaders with whom you work, seek them out and discuss what data you could provide to answer their questions. Report on data that matters to the business leader:From a measurement and reporting standpoint, L&D still puts too much of its energy into gathering and reporting data that matters to L&D but is not compelling to the business. The number of employees who attended courses or the results of your Level 1 evaluation are simply not important to the business. Look beyond your current measures and educate yourself on best practices in L&D measurement. Integrate questions about learning application and support into your evaluation instruments. This is data business leaders will care about if you show them how it affects them and their organization. Tell a compelling story:Do you remember the Magic Eye picture within a picture phenomenon? If you held the picture up to your nose, you might see the constellation Orion buried inside the picture. (I never saw anything.) If you believe your data is meaningful and can help the business, don’t use the Magic Eye approach. Don’t expect your business partner to find the meaning in the data. Rather, tell the story behind the charts and graphs through dialogue. Help your business partner connect the dots; help her understand the consequences of not acting on the data and the benefits if she does. The ability of employees to apply training in the workplace depends on several conditions, much of it outside control of the L&D department. Factors such as the quality of the training, the motivation of the employee, the opportunity to apply the training to real work and the reinforcement of the direct manager all affect the extent to which training is applied. A few years ago, I worked with a company that sold complex financial software. 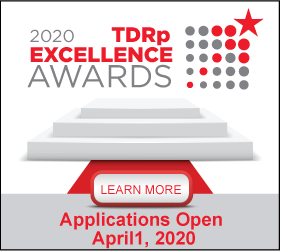 They re-engineered their implementation process to simplify the client experience, reduce implementation time and accelerate revenue recognition. The business leaders identified project management (PM) skills as critical to the success of this new approach. The Process Transformation Team identified an initial group of employees to attend the PM training and pilot the new approach with several clients. When they reviewed the pilot results they were disappointed. Implementation time had not declined appreciably and the client felt that the process was more complex than expected. The Team Leaders investigated and found that the employees’ managers were not reinforcing the training or directing them to support resources when they struggled to apply the PM methodology in a real life setting. They also found that the job aids L&D had created were too cumbersome and not designed to be used in a dynamic client setting. Imagine you are the L&D partner of the Implementation Transformation Business Leader. What data could you have provided to demonstrate that his people were not building and honing skills in this critical discipline? This leader needed a regular stream of L&D data on actual application on the job and barriers to application. He needed data on employees’ perceptions of how this training would impact business outcomes of simplification, implementation time and reduced time to revenue recognition. He needed to understand the barriers to application and where the business was accountable to address the issue or L&D. Moreover, he did not yet need incontrovertible proof that the training was improving business outcomes. Data from L&D was essential for this leader to take action and address issues that affected his ability to successfully transform a key client process. Unfortunately, the business leader didn’t realize that L&D could help him get ahead of this issue and didn’t think to ask. After L&D and the business leader started talking, sharing data and insights, the Leader not only acted, but worked with L&D to develop regular business-oriented reports. As an L&D practitioner, you can break the negative reinforcing cycle. Why not regularly provide this type of data and use it to create a dialogue about what other insights you can provide? 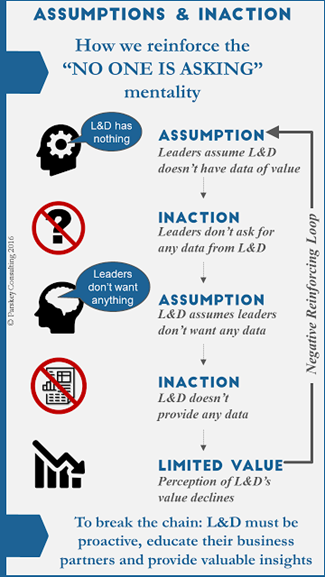 Why not take the first step to dispel the belief that L&D has no useful data or insights to offer? It’s in your hands.